This page features a gallery of featured artists, info on how to contact Christopher Roze, curator, for more information on how to purchase art exhibited at The Muse, Bay View's Gallery Guesthouse. The Muse is filled with a rotating exhibition of a wide variety of art, guaranteed to enhance your visit, feed your spirit and inspire your own creativity. 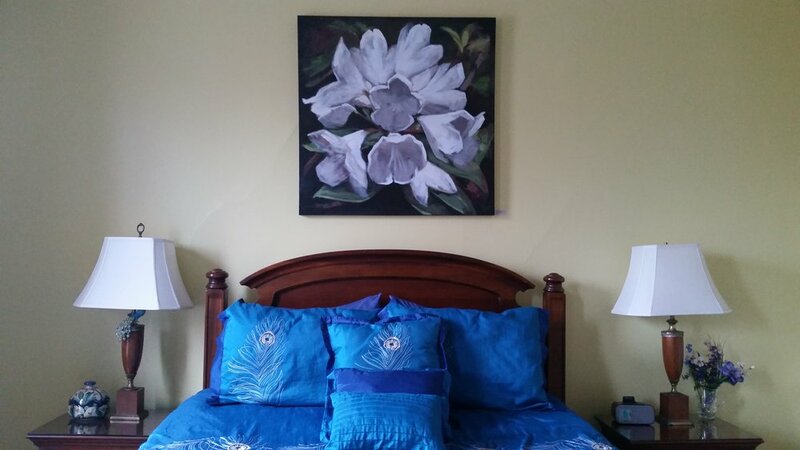 All exhibited art is available for purchase. We are committed to helping support Milwaukee's vibrant artists. We proudly participate in Bay View Gallery Night. Now on view throughout The Muse Gallery Guesthouse, our current exhibition features art by Amy Schmutte, Rebecca Wheeler, Brendan Murphy, Peter Gehrig, Nellie Gehrig, Madeline Glaspey, and Karen Williams-Brusubardis. The exhibition runs from April 1 to August 1, 2018. Please join us for an Opening Reception during Bay View Gallery Night, Friday, June 1 from 5 to 9 p.m.
My photography is a visual escape, with no heavy messages… a playground for the mind. It’s an expression of my love for the incredible qualities of glass, such as light-translucence, texture, shape and color. Each piece is a purist macro-abstraction, created with intentional avoidance of digital manipulation. The titles are derived from a brainstorm of feelings and objects that the image brings to mind, giving each piece an individual personality, a life of it’s own. Presence in ephemeral space-time is Rebecca Wheeler's goal for her photography. She shoots with a simple pocket camera, and can often be found on the shores of Lake Michigan, waiting for just the right light or the perfect wave. The photos in this series were all taken within a few hundred yards of each other on the Lake Michigan shoreline of Grant Park in South Milwaukee. They attempt to convey the changing light as winter departs Wisconsin and and the angle of the sun softens toward early summer. All photos are from 2017. Brendan Murphy is a Milwaukee-born artist who works predominantly in oil paint. He graduated from University of Wisconsin, Milwaukee with a history major and a minor in art where he first began experimenting with oils. He is interested in many different styles of painting, genres and subject matters, but with a preference for realism in all its many forms. Murphy has recently been creating a series using reflections photographed in Mylar as source material involving distorted figures and the space they inhabit; simultaneously he has continued his ongoing series of galaxies and nebulae which sprung out of a childhood love of astronomy and astrophysics. Artist that inspire his work range from Jenny Morgan, Rembrandt, J.M.W. Turner, Jenny Saville, Egon Schiele, Jeremy Mann, Gustav Klimt and Christian Rex Van Minnen. He has shown work at various venues and galleries around Milwaukee including the Walkers Point Center for the Arts emerging artist show. For more of his work you can go to his website at www.brendanmurphy.work and on Instagram @anotherbrendan. Peter Gehrig spends a lot of time looking at things. He primarily uses oil paints, watercolors, or different drawing materials to depict the feelings he has about life and the things he sees within it. The practice of art provides him a chance to slow down and step away from the chaos that sometimes shows up in life. Peter gravitated to drawing and painting while in college. He took his first painting class as an elective but couldn't stop once he started. He graduated from the Peck School of the Arts at the University of Wisconsin-Milwaukee, with a degree in Drawing and Painting. Milwaukee is where he currently resides with his wife, who was his first ever art patron. He holds his own art practice while working as a full-time stained glass artist. Peter usually makes work from life choosing to set up a still life in his studio or find one around his house. At times he ventures out into the city or countryside to paint or draw different landscapes that he finds intriguing. His subjects are quiet and are picked in the hopes that the finished work will reflect that. He focuses on finding a balance within his artwork and searches for a visual and aesthetic rightness that ties the painting to a moment and a feeling. I like to look at things and I like to paint and draw, so I paint and draw what I see. It's never exactly what's in front of me but instead is inspired by it. Through visual vehicles such as a still life or a landscape, I try to make work that reflects more than what's around me, attempting to create a balance within my work that is quiet and peaceful. My hope is to create something that can, in some small way, combat the notion of time. For me this is often found through looking and making. Educator—Nellie Gehrig is an artist and educator at Gaenslen School in Milwaukee's Riverwest neighborhood where she teaches K4-8th grade students and specializes in adaptive art. She uses art as a method for therapy in addiction counseling through Roots Milwaukee. She has worked in collaboration with Lad Lake in a community mural project for the Waukesha Juvenile Court inspired by the voices of the individuals who have been part of the judicial system. She is a practicing visual artist who works in a variety of mediums and has shown work locally and internationally. Artist—Nellie Gehrig collects from her environment and weaves as a study of connectivity. Her practice gives her the opportunity to look closely and better understand the world around her. She teaches art in Milwaukee’s Riverwest neighborhood where she lives with her husband, a fellow artist. She finds her scientific studies of the natural world inform her approach as an educator in that there is a common thread that runs through every living being. She’s inspired to create drawings that mimic narratives that can be interpreted as having a place in the world or seen as abstractions in which one creates their own. Most of my paintings depict the human figure, primarily the face. They seek to express not only the beauty of the outer shell, but also the complexity of the individual’s inner experience. I am drawn to concepts that explore identity as well as the masks we wear in our daily lives. Most often, the backgrounds are subtle and understated to let the viewer focus on the façade of the person and consider their state of mind uninterrupted. My hope is that this makes the work a more universal depiction. The result is a realistically rendered portrait that alludes to a timelessness of the human experience. I have been painting with oils for about 10 years, and love it dearly. Born and raised in Bay View, I now paint at a studio in that very neighborhood, where I work on both commissions and personal projects. Growing up in rural western Wisconsin, I spent most of my childhood exploring the woods of my parents' 20+ acres of land. I was an introverted, quiet and sensitive child with a love of exploring both the world around me and the world inside my mind. After high school, I moved to Milwaukee to attend the Milwaukee Institute of Art & Design where I received a BFA in painting. Today, I work out of my studio located in the Marshall Building on Buffalo and Water Street. My paintings are reflections of my mind's journey through the childhood places where the remembered and the imagined intersect. My imagination influences my memories. What I choose to take with me from my past is altered over time by what I believe myself to be and what I want to become. My Rebirth series of oil paintings goes back to 2012 through 2014 when I made the decision to begin painting full time after a 5 year hiatus. It was difficult to start over. I felt I needed to go back to the beginning, to a place free from the clutter and complications of city life. The result was a landscape, reborn, in all of its simple beauty. The landscape was me. This beginning provided me with the clarity I needed to move forward on a path that brought me to my next series of paintings. My Farmscape series of acrylic paintings represent the cultivation of this new landscape I was caring for. I could feel the dormant seeds of creativity finally waking up inside me and it felt great! My little farmhouses and cottages were my new shells, my safe spaces where I could decompress and find my center. Eventually, the Farmscapes led me to the work I do today, my playground of Particle Landscapes. With a new life and a firm foundation, I was free to explore. 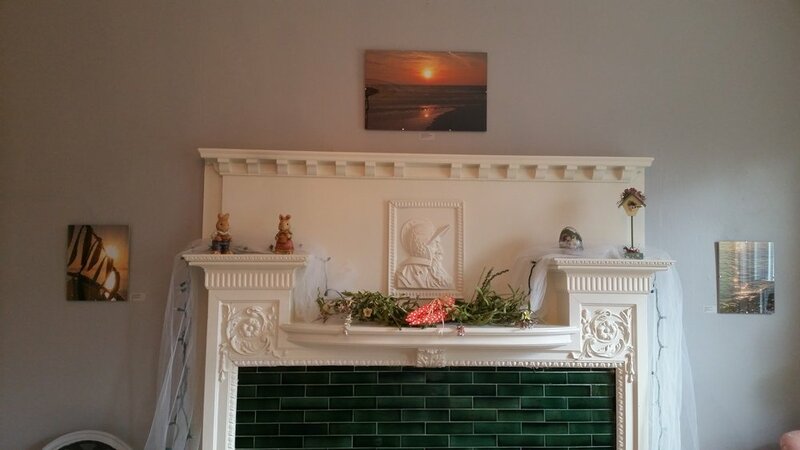 The Muse Guesthouse, located in the heart of the Bay View neighborhood in Milwaukee, Wisconsin, offers vacation rental lodging in a spacious, inspiring, revitalized 1889 house. The top floor with three bedrooms, two baths, a fully equipped kitchen, dining room with wet bar, and comfortable living room provide the perfect accommodations for up to 6 guests. The lower floor with 2 bedrooms, each with en suite bathrooms. For B&B guests, breakfast is served daily. Or guests can book the top floor or entire house as a self-catering Vacation Rental Home. 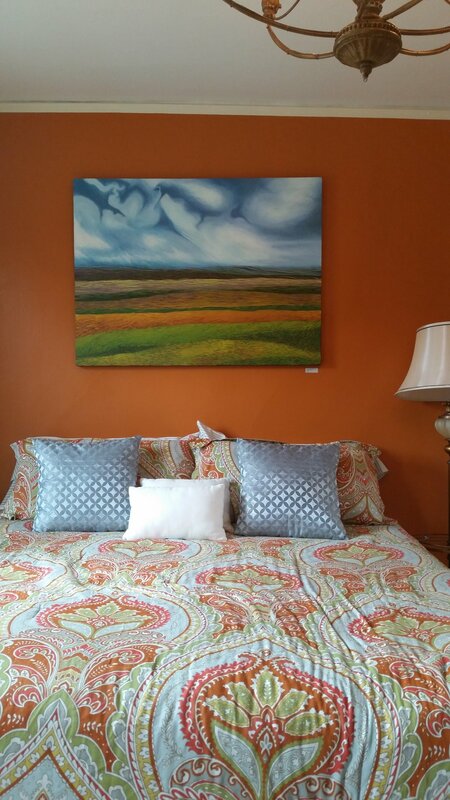 Filled with a continuously rotating exhibition of a wide variety of Milwaukee area artists, with all art available for immediate purchase, The Muse is Bay View's Gallery Guesthouse. 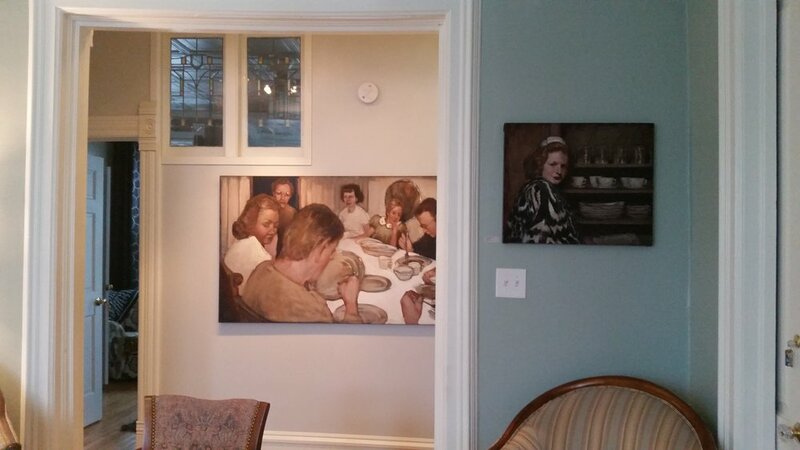 The art exhibited and sold at The Muse is managed by Renée luna Bebeau. Contact her at moonunitluna@hotmail.com or www.reneebebeau.com if you are interested in art you've seen at the Muse. Photography throughout the site courtesy of: Megan Moran, Joel Richter, Steve White, Mary Ellen Hermann, Jeff Redmon and featured artists. June 1, 2018 5-9 p.m.